William Russell is a leading independent provider of life and international health insurance solutions. William Russell is one of the world’s best providers of international health care plans. Formed in 1992, William Russell has built its reputation with insurers, intermediaries, and clients, around the company's high standards of service and dedication to customer care. By providing high value international health, life, and disability insurance worldwide, William Russell is committed to offering its customers the best services available. 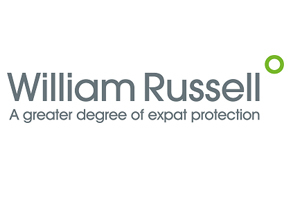 William Russell works with expatriates and foreign nationals in over 194 countries, with offices around the globe, making them one of the largest and most capable insurance providers in the world. By introducing new and innovate ways to interact with their customers around the world, William Russell has proven, time and again, that they are a leader in the international health care plan industry. Working with one of the world’s leading insurance underwriters, AGF, means that they are able to offer some of the best products available in the international insurance industry. By actively searching for new and better methods with which to provide protection to their clients, William Russell is truly one of the best providers of international health care plans in the world. "I recently purchased coverage from William Russell for my son who is not covered under my husband's employer's plan. Not long after, my son knocked his front tooth out while playing rugby. After much chaos, my broker at Pacific Prime was able to direct me to a recommended dentist and William Russell fully took care of the surgery needed to reattach the tooth. I've heard many nightmares back in the States about insurers not covering dental, even in emergencies. Needless to say, I am very satisfied with the level of coverage from William Russell!" "My fiance and I recently went to Australia and New Zealand for a long vacation. While in New Zealand, I was food poisoned and felt like I was going to die! The hotel arranged for me to visit a local hospital and I had to stay overnight with an IV drip. I was relieved to learn that my "Essential International Health" plan from William Russell covered the whole ordeal."